After a day back in Kuala Lumpur and sweating through most of our clothes (not the healthy sweats from perfectly spicy food), a trip north to a Malaysian retreat is the perfect remedy for our heat-shocked bodies and minds. 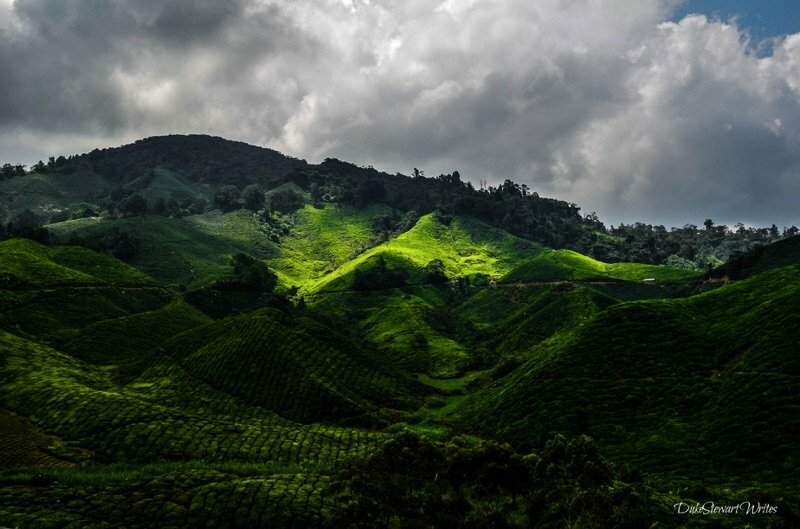 Our visit to the Cameron Highlands will leave me sad that we couldn’t stay longer, and a further reminder that there’s never enough time when traveling. At least I have these words as a testament to that special time in such a wonderful place. This Borobudur travel guide is part of our series on Malaysia Travel and Southeast Asia Travel. It was originally created on September 4, 2015. It has been maintained and updated (as of December 27, 2018) to reflect current viewpoints and travel trends. The drive away from Kuala Lumpur would seem familiar to anyone from a big city. Our bus stops and starts along with the morning traffic when leaving the booming capitol. I am more concerned with the joyous air conditioner blowing down from above. Cars bounce from lane to lane on the expressway and our ride sometimes joins in, passing slower trucks and cars to make good time on this hot Wednesday afternoon. At our only stop, I load up on peanuts and bottled water spiked with some British breakfast. The bus gets back on the road for the rougher leg of the trip away from those comfortably straight and even roads. My mind quickly flashes to West Virginia’s Route 10 where safety and space lost out to shorter distances and cost-efficient construction. Somehow this is much worse as every curve becomes a 90-degree angle. It wouldn’t be so bad if we weren’t seated at the front of the bus, meaning I’ll be the first one after the driver to deal with every horror-filled corner. Occasionally we meet another car and my eyes stay open for as long as they can take the suspense. Every twist and turn is similar to the original Halloween movies that still force me to search for cover. After an hour and a few close calls, we arrive at the bus terminal in one piece and walk towards our hostel. A walk through Cameron’s Tanah Rata reminds me that the world is getting smaller each day, as we pass a crowded Starbucks. Before finding our place, unfamiliar and wonderful smells surround us at every turn. Curry restaurants and Malay eateries dominate the scene, with Halal food and fruit shops in between. Everything is cheap too, as long as its local food one is after. We’ll be eating well and cheap here in Cameron, I say to myself. After checking into our 4th-floor room and chat in the common area with some other travelers, we immediately head back to the first restaurant that seemed worth a try. Aptly named Curry House, my mouth falls back in love with some of the best tandoori chicken and naan that I’ll ever eat. Whenever I have good Indian food, the idea of building a tandoor in our future backyard comes to mind. The neighbors can even come to use it for a small fee if they want. Business would boom in the winter, I think to myself. After a quiet and relaxing walk around the shops, we turn in for the night and prepare for a day at Cameron’s tea fields. A cool morning welcomes us, as Cameron’s temperatures are much milder than that sauna back in Kuala Lumpur. 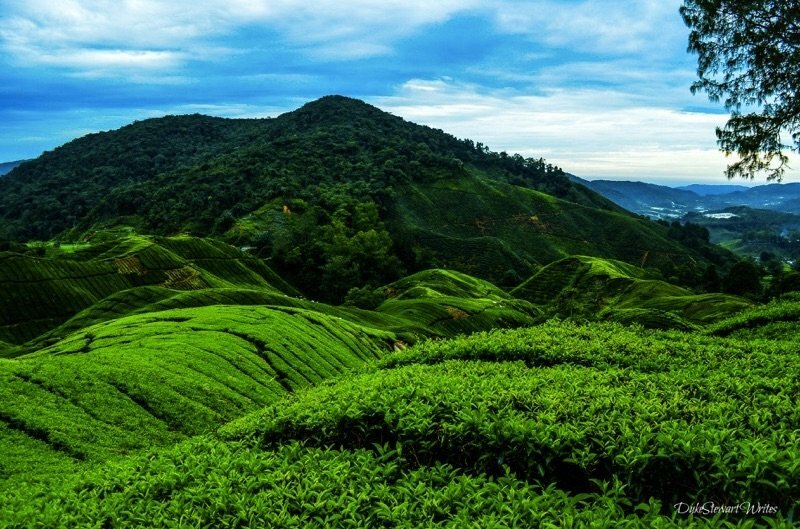 I now get why the Brits chose this wonderland as a retreat even before discovering its tea-growing capabilities. We follow a man into a white and mostly empty Landover while others are piling into cars, most likely on the most popular tour that will search for that big flower. 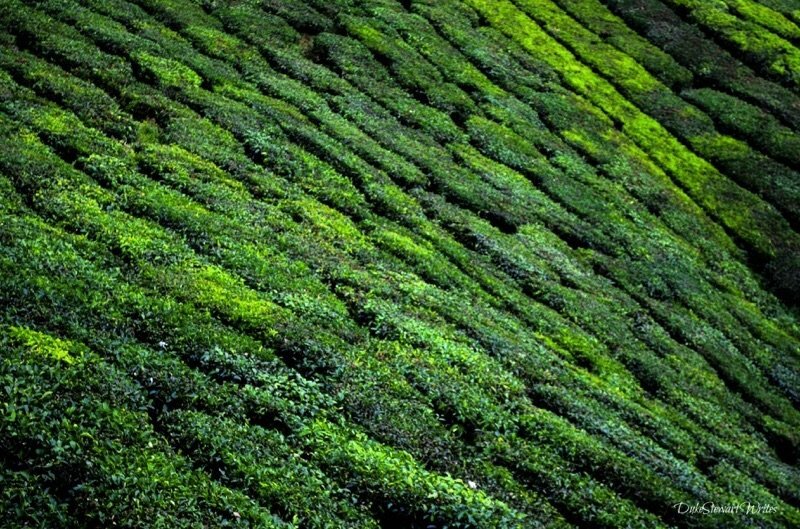 Our goal is to visit the mossy green forest and have some tea, just taking half the day. A bumpy and curvy drive towards the Boh Tea Factory leads to a couple of close calls but our guide Raju is on it, complaining about the tourist drivers as he honks and swerves and brakes around would-be catastrophes. Dealing with Cameron traffic is nothing to this man, and we eventually break away from the main road onto a steep and even curvier procession of roads that I’m able to photograph near the end. That great man Raju fits the car like a glove in front of a tree and it’s time to talk some tea, as he coolly puts it. 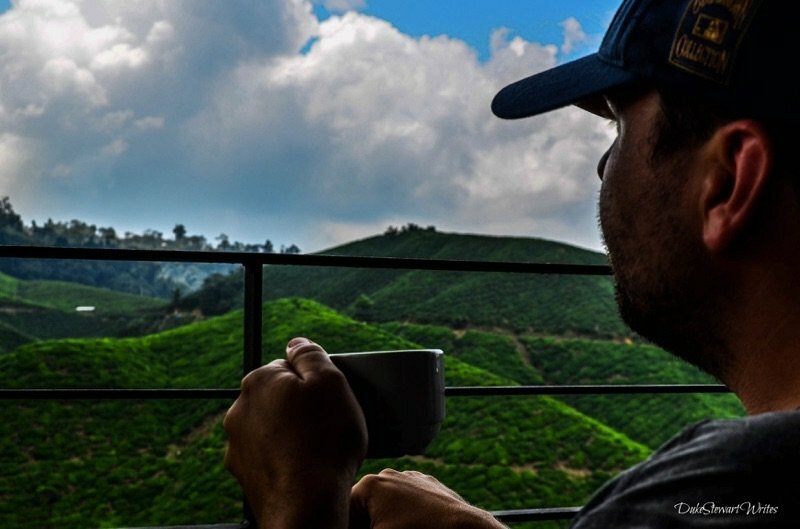 We walk around and take some photos of this first stop while listening to him colorfully describe tea, its origins, and scientific properties as well as how it’s processed throughout the world. 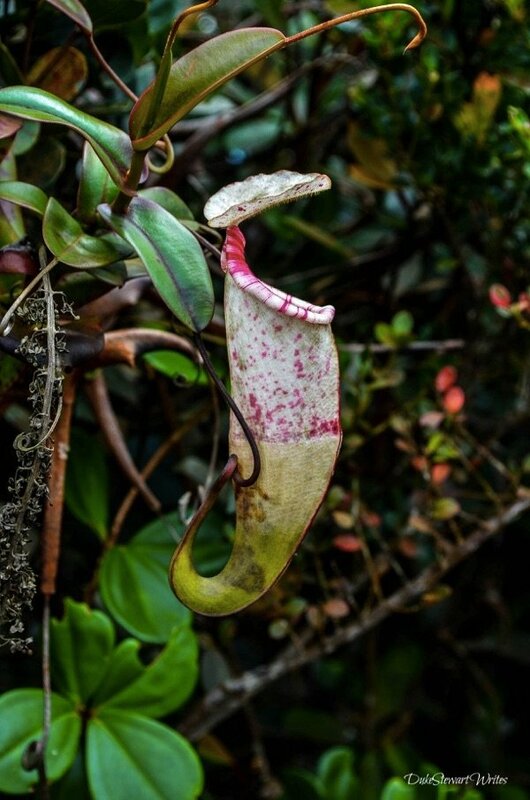 Essentially it’s the same plant but produces three different varieties according to processing method, as he explains. 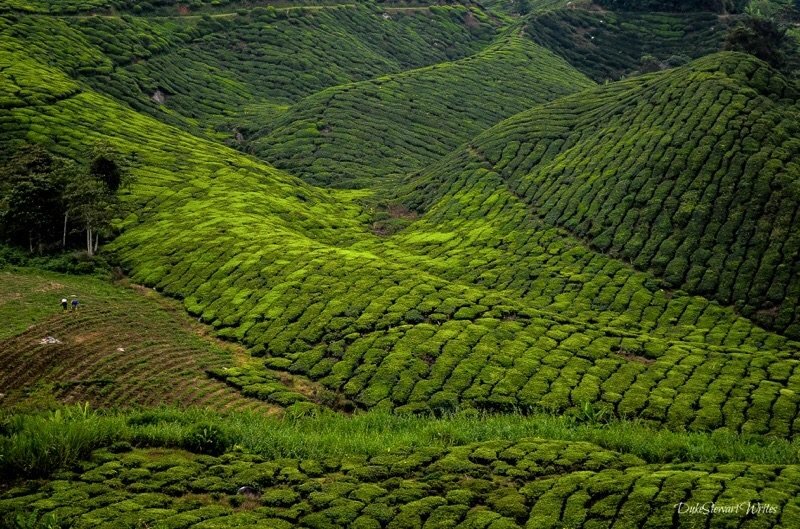 These fields only produce black tea and if one buys green or oolong here, it’s most definitely imported. After a couple of stops for pictures and chats with Raju about everything from tea to the current state of Malaysia’s political problems, he drives us closer to the tea factory. The issue of the yellow shirts and clean elections come up but Raju eventually pulls it back to the history of this wonderful scenery surrounding us. Raju notes that most of the workers aren’t Malay and mostly hail from neighboring countries, in search of better work opportunities. They work upwards of 12 hours every day and are paid based on the quantity and quality inside their bags. Apparently young Malaysians think this kind of work is beneath them. Does that sound familiar to anyone? We walk through the mossy forest but without the mist that really gives that Lord of the Rings feel. My wife will later mention that travel is hardly filled with perfect meetings of weather and terrain. 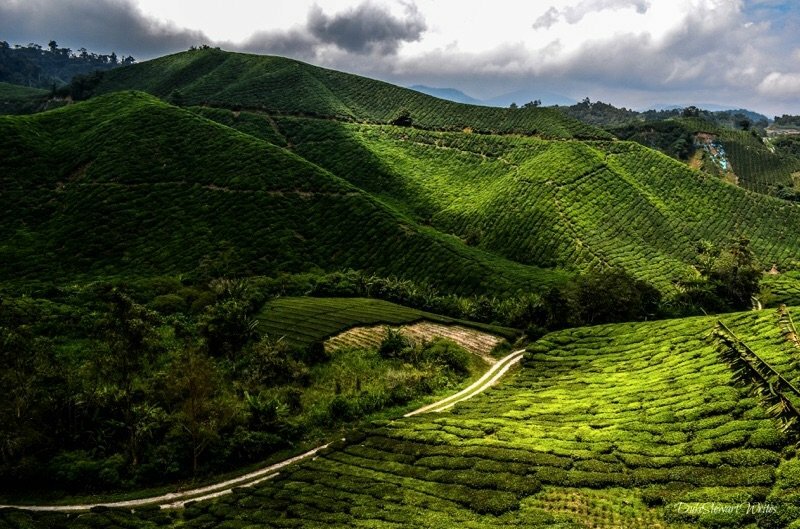 Even so, who can complain about this beautiful scenery and the tea-covered hills we’ve been walking through today? Raju then takes us to the tea factory, the museum, and teashop but warns us to spend as little time at the first two. You’ll want that view, he says before leaving us alone for an hour. Even though we don’t get the best seat in the house, the view is worth the journey. The mixtures of green against the changing sunlight and shade are so perfect that we’ll come back the next day with a couple of new friends we’ll meet at the hostel. At the BOH in the Cameron Highlands. #love this view! 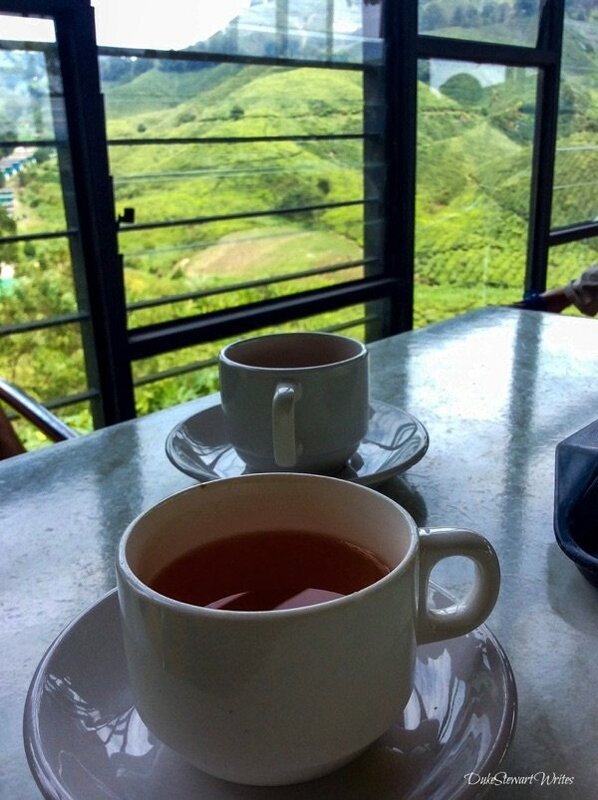 After a hike and another visit, another teapot, and another scone it’s time to leave the Cameron Highlands. We continue drinking Boh tea on the morning of the bus back to KL, thanks to a massive purchase at the souvenir shop. A friendly face awaits us at the bus terminal, as a German friend we’d met is waiting for a bus to Penang. Only 3 days into our trip and we already have friends and memories that will always be around. We bid each other auf wiedersehen and take a few deep breaths finding our seats for the ride back to Kuala Lumpur. The bus leaves on time and should get us back into the city by noon. I notice blue plastic bags in each seat and fear the worst, which my stomach will gladly say came to fruition. The ride down the mountain and back to flatter, straighter lanes is terrible in comparison to our first trip. This time we are safely seated in the middle of the bus so there’ll be no more horror show corners during this trip. Yet for the first time in years, I start feeling nauseous and have to breathe heavily to get out of that pickle. As I’m close to losing it, a Malay man in front of us starts upchucking and strangely calms my own bad feelings for the rest of the journey. We get a final look at the fields that lead into the Boh factory and teahouse, remembering Cameron as a truly special place. A box of tea remains in our bags and every time I take one out to put into a cup or plastic bottle, a huge whiff of Cameron shoots up my nose and fills my brain with memories of three spectacular days. 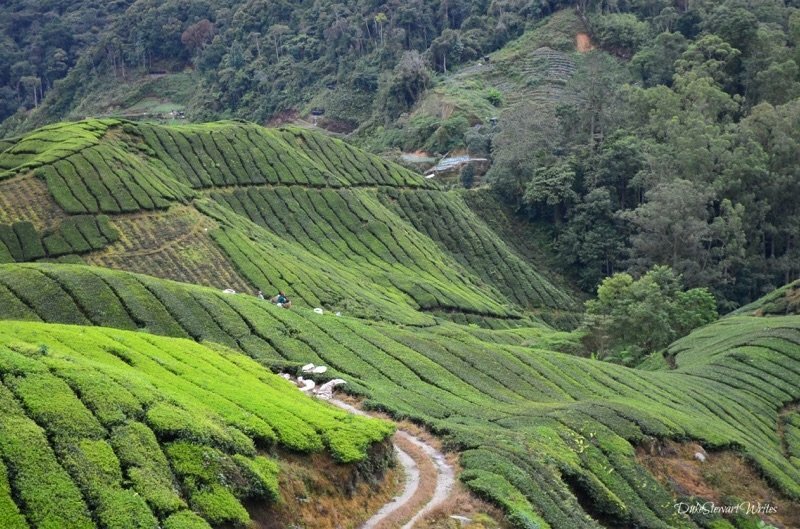 This visit to the Cameron Highlands will take a while to erase, thanks to some truly high tea and more. 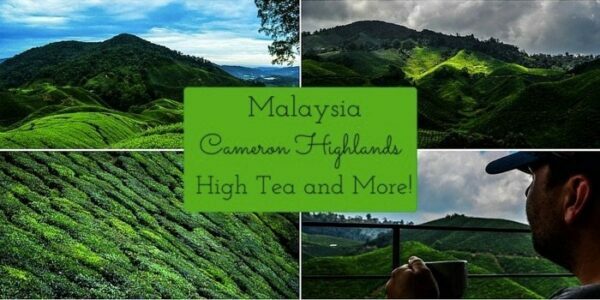 Would you like to experience high tea at Cameron? Check below for more information! Want to read more about Malaysia? Click Here! If you really liked reading through these words and photos, take a look at the subscription box at the top of your screen. I love connecting with people via email and give away something for free every week! I’ll have a much more detailed post about Getting Around Cameron in the future but for now, here’s a quick tip on how to get some good high tea and more! There are plenty of tour companies in Cameron and since guides move around, it’s difficult to recommend a specific one. 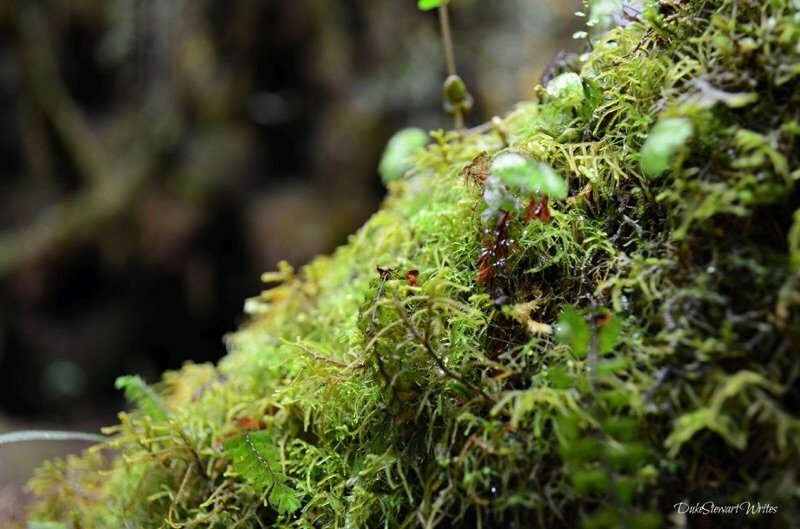 For our walk through the Mossy Forest, we went through Eco Cameron and chose the half-day tour of the Mossy Green Forest and the Boh Tea Fields. **Disclaimer** I don’t receive any compensation for any clicks to this tour company. They are simply who we went through while staying in Cameron. Sounds and looks like you had a really interesting time. I can only echo the others here in saying that Malayasia is a great place and whenever going there it always feels like going home ! But then a lot of places in Asia do that too – now, time for tea ! I miss that tea oh so much! Enjoy, Ben:) Thanks for commenting! Try doing that road 6 weeks pregnant with the future Adam Wright. You’re one tough cookie. That’s for sure! Wow, that sounds like an absolutely harrowing ride to get to the Cameron Highlands. Lucky you didn’t start sympathy upchucking when the man in front of you did! I absolutely loved the photos for this… the weather looks like it cooperated really well. It’s days like that where some clouds are nice to have… they make for gorgeous shots! I’ve been on a few nutz bus rides; this sounds like an epic one. Thanks for the fab images. Enjoy Penang! Hey there Ryan! Thanks for stopping by and leaving such an awesome comment. I can vouch for some rough rides in Thailand but not Laos yet unfortunately. I certainly worry about being part of a tragic headline when grabbing my seat. Shew! Anyway, all is well so far. I’d love to meet up for a beer and just hear some of your stories. I bet you’ve got a few:) Take care man and I’m looking forward to reading up on your next adventure! Malaysia has to be one of my favourite countries in the World. I wish I’d had more time there! 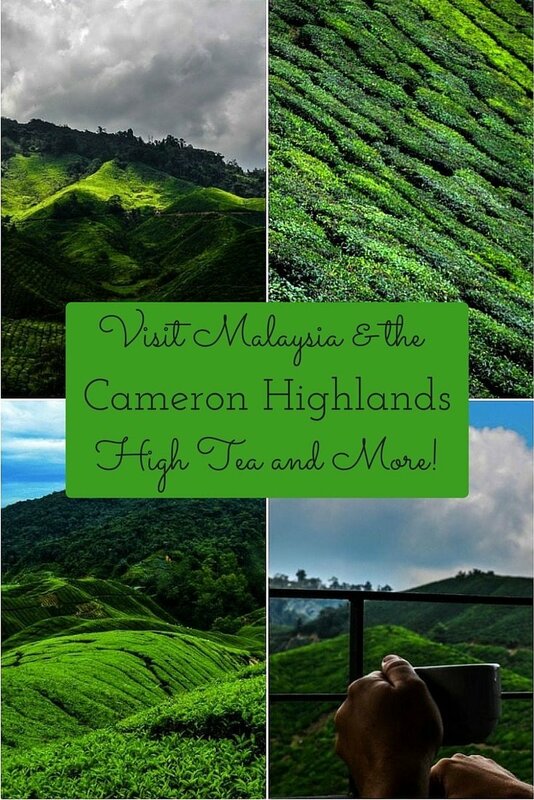 I heard so much about the Cameron Highlands, but just couldn’t make it before my flight. 🙁 Reading your post and looking at the amazing scenery reminds me that I need to go back!